It’s the time of year when everyone makes cookies and fudge, rich foods appear on banquet tables, and bottles of scotch and gin appear under trees as if brought by elves. Holiday cheer often comes in the form of indulgent food and drink which many of us “should” ourselves into feeling guilty about consuming. This year, I find myself wondering if all the “guilt” does more harm to our health than we could ever do by indulging with pleasure. 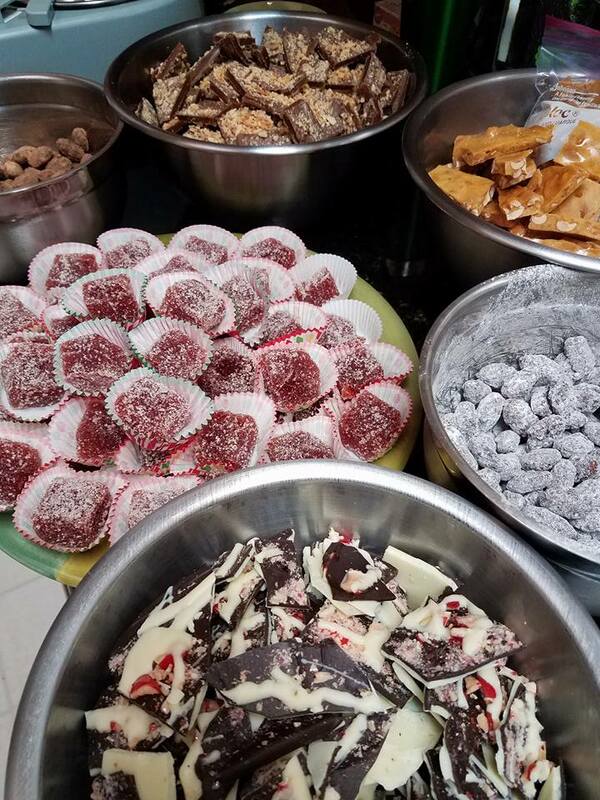 Every year, between Thanksgiving and December 31, I make over 350 pieces of candy and distribute them all over the country to family and friends. 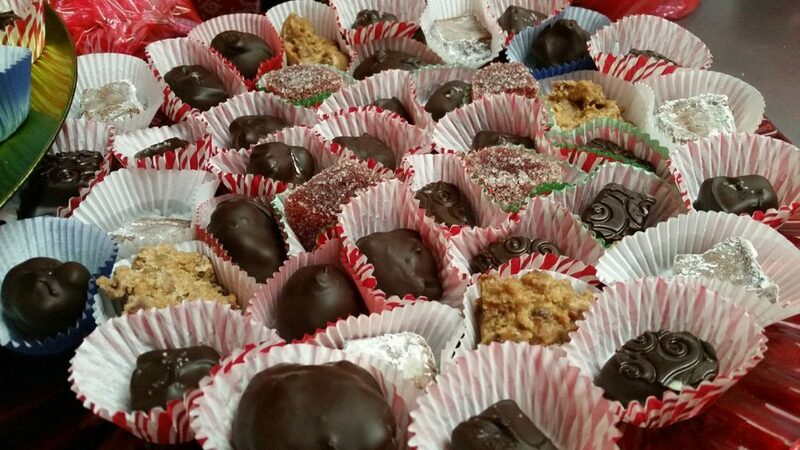 Anyone I want to thank receives a box of handmade treats, filled with love. There are truffles, caramels, peanut brittle, fruit jellies, peppermint bark, toffee, chocolate covered fruits and nuts, liquid center cherry cordials…every year the selection is different as I play with new recipes and new combinations along with a few tried and true staples. 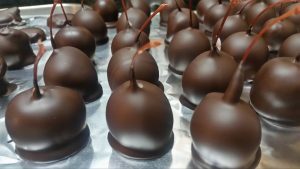 Every piece is hand dipped in tempered chocolate and garnished with an appropriate decoration to make these nuggets as appealing to the eye as the tongue. I believe good food should appeal to ALL of the senses, and the first encounter is typically VISUAL if not olfactory. I’ve been doing this for nearly 15 years, and it’s an incredibly time consuming and somewhat costly venture which I absolutely love. It’s part of what makes the holidays the holidays for me. Well, my friends, here’s the deal – CANDY IS NOT A HEALTH FOOD. Candy is food for the soul and the senses, not for the body. And in my book, sometimes the “unhealthy” foods which make you feel good in your heart are as “good for you” as the “healthy” foods which are nourishing to your cells. Yes, my caramels contain corn syrup. Yes, I object to commercial food producers using high fructose corn syrup as the primary sweetener in products which are over-sweetened and an every day part of a diet. But in candy (and some other foods), corn syrup serves a purpose. Do you ever wonder why peanut brittle is hard and crunchy while other caramel melts in your mouth? Why some fudge has a wonderfully creamy texture, but some feels gritty? Chemically, all sugar is made up of hydrogen, carbon, and oxygen molecules which are connected in particular ways, and there are several configurations for these atoms to adopt which result in different crystalline structures for the sugars they form. This crystal structure is affected by temperature, pressure, and which sugars go into the pot. 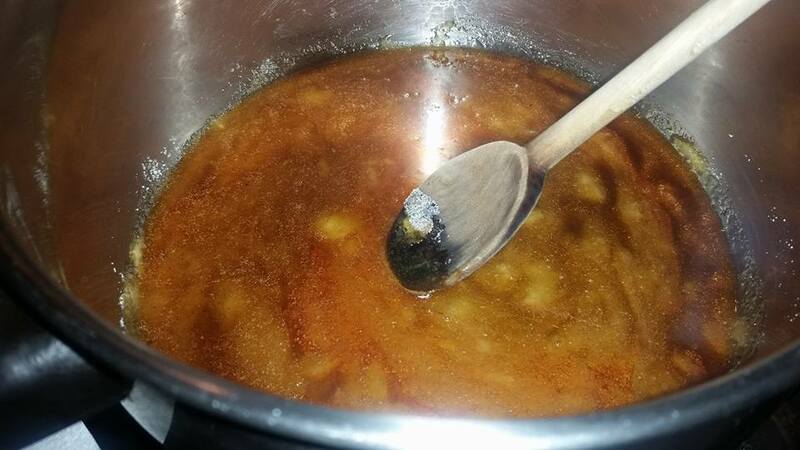 To make my signature sea salt and lime caramels, I start by melting organic cane sugar in a heavy pan. When the sugar is completely liquid and reaches the color I’m looking for, I add a bit of corn syrup. It cools the mixture slightly, and introduces a new crystal (corn syrup is mostly fructose which has a different crystalline structure than the sucrose in cane sugar) which provides a structure for the melted cane sugar to crystallize around. Next, hot (yes, organic!) heavy cream is added, and the whole mixture is heated to exactly 252 degrees before the salt and lime juice are added. The temperature at the end matters. The temperature of the cream matters. The corn syrup matters. And when all of these elements are present, candy magic happens and you get a sweet, tart, pleasantly salty, melt-in-your-mouth experience. Chemistry in action in a home kitchen. Let’s put the corn syrup in perspective. There are 2 tablespoons of corn syrup in this recipe. 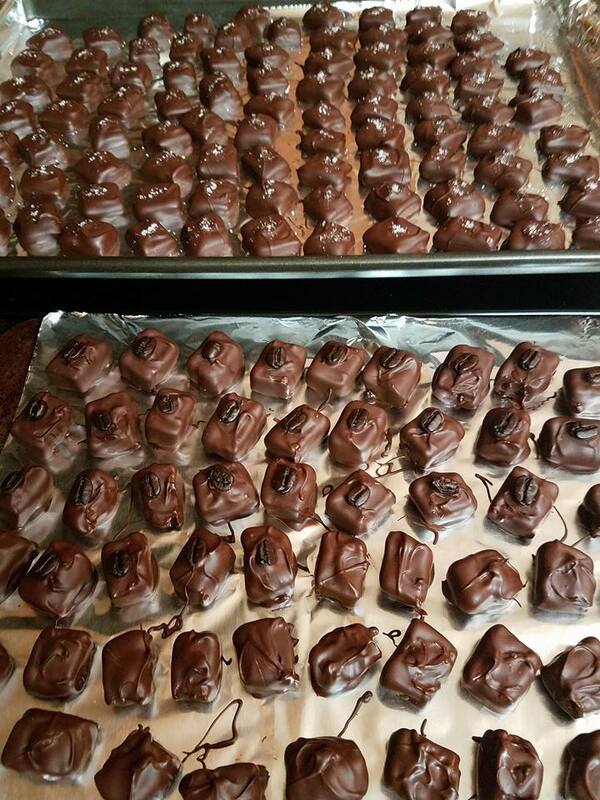 A recipe makes an 8×8 inch pan of caramel, which yields between 72-81 pieces of candy once it’s cut into pieces and dipped in chocolate to make bite-sized pieces of yumminess. I haven’t done the math to see just how much corn syrup and potential GMO there is per piece, but I can say it is VERY little. In this case, the risk to your health from worrying about consuming the GMO corn syrup is far greater than the risk to your health from eating a piece (or 3) of this caramel. My point here isn’t to rant about my friends or to go on a crusade about the evils of corn syrup. My point is that food, in and of itself, is not “healthy” or “unhealthy”. Food is made of various chemicals (think proteins/amino acids, fats/fatty acids, sugars, vitamins, minerals, fiber) which individually and synergistically have an impact on physiology once they have been chewed, swallowed, and processed by stomach acid pancreatic juices. Too much of virtually ANYTHING is “bad” for you, and not enough of many things is equally “bad”. If your diet consisted of only kale, you would not be “healthy”. Sugar, even corn syrup, is not inherently unhealthy or bad for you, but can be terrible when you eat too much of it and it’s out of balance with other nutrients you need. Add to this that food nourishes not just your body, but also your spirit, and you can see that obsessing over the quality/source/ingredients in everything you eat can be just as “bad” as eating too much of the wrong things. So what’s an omnivore who wants to optimize their food for health to do? Make the majority of your diet whole foods and organic when reasonable (think availability, quality of the product, and cost). Enjoy meats in moderation and purchase the highest quality you can afford. Limit (note that I didn’t say “avoid like the plague!) alcohol, gluten, dairy, and simple sugars which can be inflammatory when you eat too much of them. Avoid foods you have known sensitivities to. And whatever else you do, take time with your meals and ENJOY the simple sensual pleasure of nourishing yourself, body and soul. 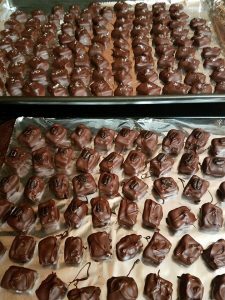 This entry was posted in Food and Recipes, Nutrition and tagged caramel, chocolate, holiday eating. Bookmark the permalink.